Will the sun get us off the global warming hook? I read this article from National Geographic with a sigh. If the sun enters a grand minimum, a period of unusually low solar activity, we might not get a global cooling, due to the already warming effects that are present. Unlike the last Maunder Minimum, between 1645 and 1715, which coincided with the coldest spell of the Little Ice Age, when European canals regularly froze solid and Alpine glaciers encroached on mountain villages, it is expected that the global warming will prevent a Little Ice Age. However, maybe the effects will mitigate some of the global warming expected this century. Well, that’s good eh? Yeh, if you want an excuse to continue to belch pollution all over the planet, severely interfering with the respiratory systems and food chains of every organic population, including humans. Yes, if we want an excuse to just carry on cutting the throats of our unborn grandchildren, then let’s crack out the bubbly and give ourselves a pay rise. We are such morons. *From Umberto Eco’s Focault’s Pendulum: Morons never do the wrong thing. They get their reasoning wrong. Morons occasionally say something that’s right, but they say it for the wrong reason. Morons are tricky. Plenty of moron’s books are published, because they’re convincing at first glance. a different sort of weather system is swirling over sand banks, through ocean trenches and across underwater plains. Hidden from view, it’s not as easy to see the impact global warming might be having on the biodiversity of the sea. Last year, CSIRO scientists identified over forty aquatic species off the coast of south-eastern Australia which had changed their location, increased in number or nearly disappeared. Increases in the temperature of the ocean’s currents mean some species are forced to head south to cooler waters. Temperature change isn’t the only thing marine species have to cope with. Over the past half a century, the current flowing down Australia’s east coast has grown twenty percent stronger, causing a slight rise in water levels off the southern coast. For habitats in shallow water, such as mangroves or tidal zones, such changes to their ecosystems could see many species struggle. Ocean currents are as important to marine life as our weather is to us. Its temperature, flow, chemistry and the mix of nutrients determine what can survive and what can’t. Knowing which marine organisms will flourish and which will vanish requires a combination of good information and sophisticated mathematics. The South-east Australia Fisheries and Climate Change Program covers a range of projects that is attempting to understand how the climate influences fish numbers, location and diversity. As a resource, our nation’s fisheries supply us with a significant amount of food. Even though we’re surrounded by ocean, it’s easy to focus on the climate change above us and overlook the many changes below. The image above indicates that these floods are not an aberration – they have been occurring ever since European settlement and there is evidence of flooding prior to this. I read about Brisbane’s flooding problem while doing a geography major at university. Through an article by Rahman and Weber we learned that Brisbane is prone to flooding because of flash flooding of creeks within the city due to severe thunderstorms, overland flooding due to built structures impeding and redirecting the natural path of rainwater overland and flooding of the Brisbane river (Rahman and Weber, p. 74). Brisbane is hilly and therefore has many valleys where floodwater accumulates. Unfortunately buildings have been sited in areas where floods can occur. The Bureau of Meteorology has summarised the history of flooding in Brisbane by graph and a chronology. 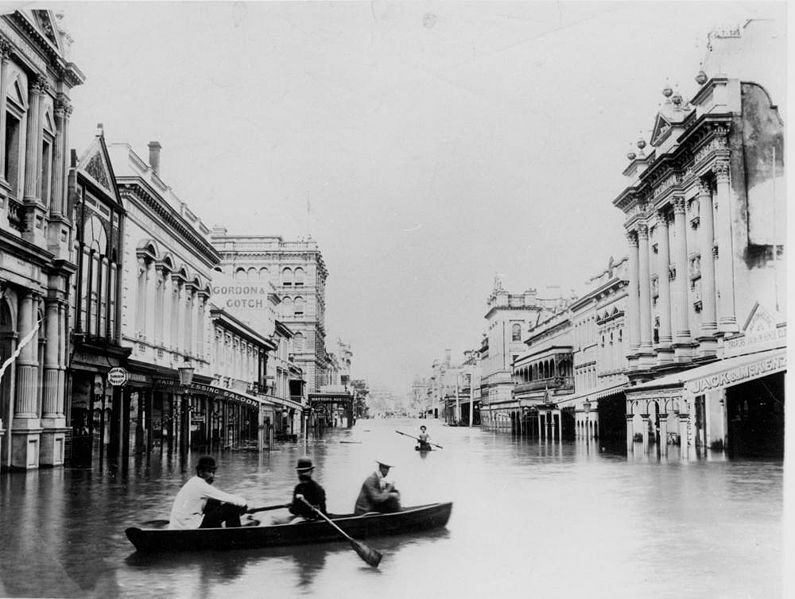 This shows 1841 was the year when Brisbane suffered its highest flood levels. 1893 saw flooding that almost reached the levels of 1841. The 1974 floods were severe but considerably lower than the floods of the nineteenth century. While the 1974 floods were higher 6,700 homes were affected whereas in 2011 14,700 homes were affected. The inescapable issue that the authorities will have to grapple with in the aftermath of this tragedy is how to plan for the future. These floods will occur again and again. New buildings and structures will need to be constructed to replace those that have been destroyed. Where will they be placed? Rahman, K., and T. Weber, ‘Sustainable urban development in Brisbane City – the Holy Grail?, Water Science and Technology, 47 no. 7-8, pp. 73-9. Here is the frog in the downpipe outside our bedroom window. Oh, and of course the cicadas as a background noise, settled at this time of night but at a level which can’t be heard over at 7pm (first dark).